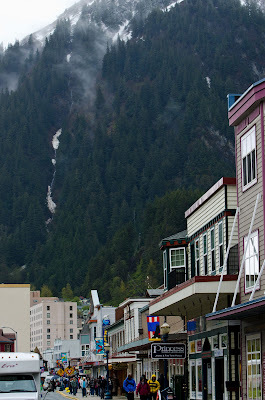 Yesterday was our first day in Juneau. We’ll be repeating this port next week, so we planned to scope it out this time around. We walked in the rain all around the town. Shopping is the biggest attraction here, so we did. I got an onyx and gold whale tail set of pendant, earrings, bracelet, and ring that are beautiful. We picked up a few other souvenirs also. 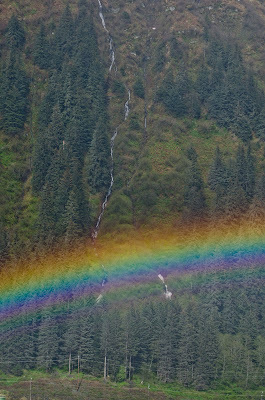 Next trip to Juneau will be our whale watching tour with Captain Jack. This is something we booked on our own, not with the cruise line. He’s famous for being the only tour guide who puts a microphone into the water so you can hear them sing. I’ve spoken with Jack a few times on the phone and he seems super nice. We met his daughter in the store where I bought my jewelry. We enjoyed talking with her and admiring all the photos on the wall in her store. Now I’m even more excited about this tour. There’s a tram that goes to the top of Mount Roberts. It was snowing up there and the view was completely obscured, so we didn’t bother. Maybe next time. 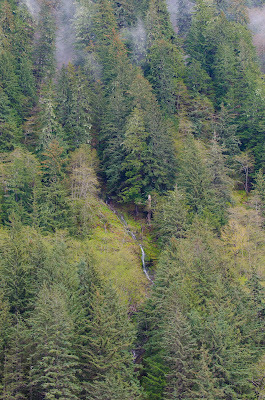 I LOVE waterfalls, so I have to include this one. When we headed out of the port, we were headed into terrible weather - was rain mixed with sleet. But just before we got to it, the sun was also trying to come out. 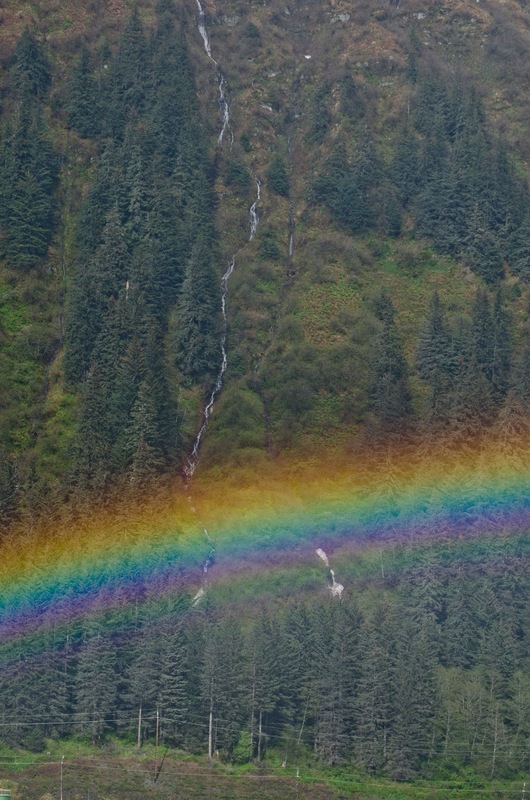 I knew there would be a rainbow somewhere, so I waited for it, and sure enough it came. 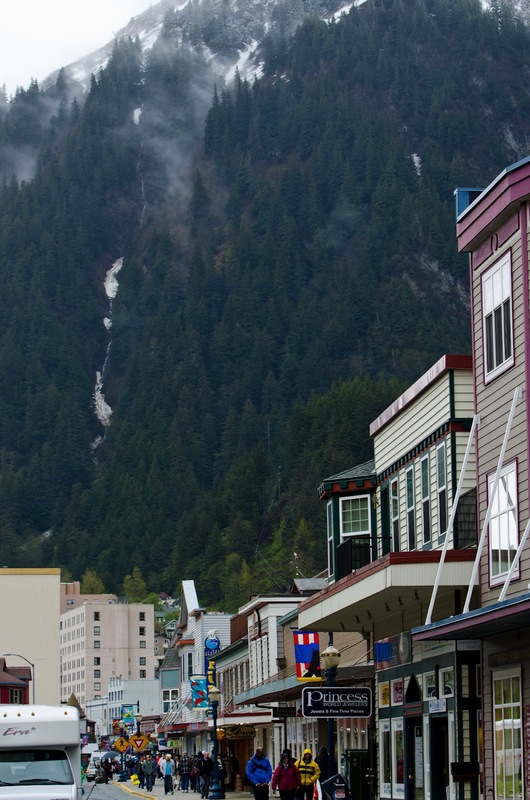 Today we’re in Ketchikan – the salmon capitol of the world. They get an average of 360 inches of rain here every year – almost an inch a day! We were sure it would be pouring all day. Surprise! We arrived to a beautiful, sunny day. We bolted out as soon as we could to enjoy the sun. Unfortunately it didn’t last. We walked back in the rain with a really cold wind. So we were glad we went out early. I didn’t take very many pictures here. We’ll be back here again next week, too. The internet is giving us fits - it's super slow and taking FOREVER to upload each photo. Hopefully it will be better next week on Rhapsody and I can upload more.